Skellig Michael was inscribed on the World Heritage List in 1996. The island supports 128 species of lichen. The first monastery on Skellig Michael was reputedly founded by St Fionán in the 6th Century. Skellig Michael has two lighthouses. Only one (the unmanned Lower), still functions. Sceilig Bheag (Little Skellig) is home to some 27,000 pairs of gannets. Awesome is a much-overused word, but there are few others to adequately describe Skellig Michael. It was here, between the 6th and 8th centuries, that devout Christian monks sought extreme isolation. They certainly found it. Skellig Michael (Sceilig Mhichíl) and its smaller sister, Little Skellig (Sceilig Bheag), make up the Skellig Islands – second only to the Blasket Islands as Europe’s most westerly point. Visitors here have been varied, among them Norway’s first king, Olaf Tryggvasson (he was said to have been baptised on Skellig Michael), and literary legend, George Bernard Shaw. Shaw later commented that Skellig Michael was an ‘incredible, impossible, mad place’. It was, he wrote, ‘part of our dream world’. 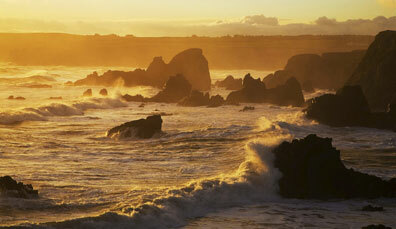 The Giant’s Causeway was inscribed on the World Heritage List in 1986. Trinity College fellow Sir Richard Bulkeley is credited with ‘discovering’ the causeway in 1693. The causeway consists of approximately 40,000 columns. The tallest column measures 12 metres (36 feet) in height. The Giant's Causeway visitor centre has won awards for its sustainable design. Myth shrouds this coastal Antrim oddity (get the full story of Finn Mac Cumhaill v Scottish giant Benandonner here) but the facts are arguably even more impressive. As a result of violent volcanic activity 60 million years ago, thousands of basalt columns popped up on what would one day be named the Causeway Coast. Known locally as ‘giants eyes’, these octagonal stepping stones aren’t the only curious stone creations on this stretch of coast. A modest wander will bring you face to face with the Organ, the Giant’s Harp, the Honeycomb and more. For sheer otherworldliness, the Causeway can’t be beaten. This UNESCO site keeps itself in good company, too. 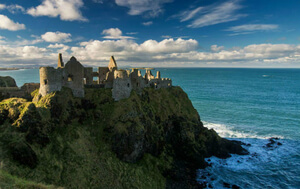 A mere 20-minute drive east swings the sea-spanning Carrick-a-Rede-rope bridge, while a six-minute jaunt south west will place you in the town of Bushmills, famed for its eponymous whiskey distillery and the award-winning Bushmills Inn. And rest assured: no warring giants will spoil your fun. 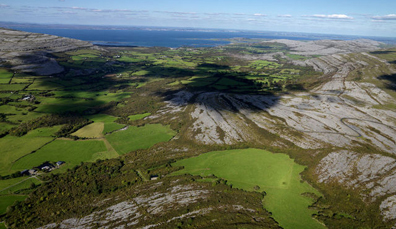 The majestic Cliffs of Moher and the other-worldly lunar landscape of the Burren make County Clare’s first entry on UNESCO’s list. Stretching across the southern coast of Waterford along Ireland’s Ancient East, this beautifully diverse area contains remains from the last ice age. 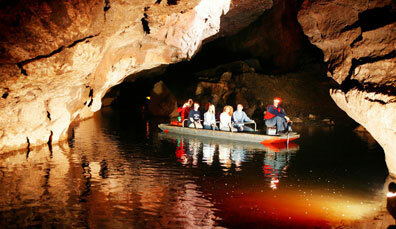 At the foothills of Cuilcagh Mountains is a subterranean world filled with rivers, waterfalls and winding passages. A unique UNESCO site. Looking for Ireland’s most famous passage tomb? Newgrange is it. Thanks to the ingenuity of its pagan architects, the building itself predates even the pyramids at Giza. And while its grass-topped exterior is a visual treat, what really excites about Newgrange is what’s on the inside. Come the winter solstice on 21 December (the shortest day of the year in Northern Europe) a shaft of sunlight creeps through an opening in the roof box. The result? A resplendently illuminated inner chamber and one of the oldest sun celebrations on the planet. Brú Na Bóinne was inscribed on the World Heritage List in 1993. The name Brú Na Bóinne means ‘Palace of the Boyne’. The site is located in the Boyne Valley. Materials used in the building of Newgrange were sourced from the Wicklow and Mourne Mountains, and Carlingford. In 1967 Professor Michael J. Kelly the first person to experience Winter Solstice at Newgrange for more than 5,000 years. Dowth and Knowth are the other two principal passage tombs at Brú na Bóinne. "It was one of those rare experiences of heightened spiritual awareness. I was on a high for days after the experience." Tour Guide Michael Fox speaking to The Guardian newspaper about the Winter Solstice at Newgrange. Should it sound like the kind of experience that would sit snugly on your bucket list, you're not alone. Thanks to a modestly sized inner chamber and a vast interest, the audience entitled to view the Winter Solstice from inside Newgrange is chosen by lottery. In 2014, for example, an astounding 30,542 entries were received. Here's all the information you'll need to apply. In the event that your lottery luck escapes you, visitors are still invited to gather on the hill and watch the sun illuminate this Neolithic monument, just as it has done for over 5,000 years. 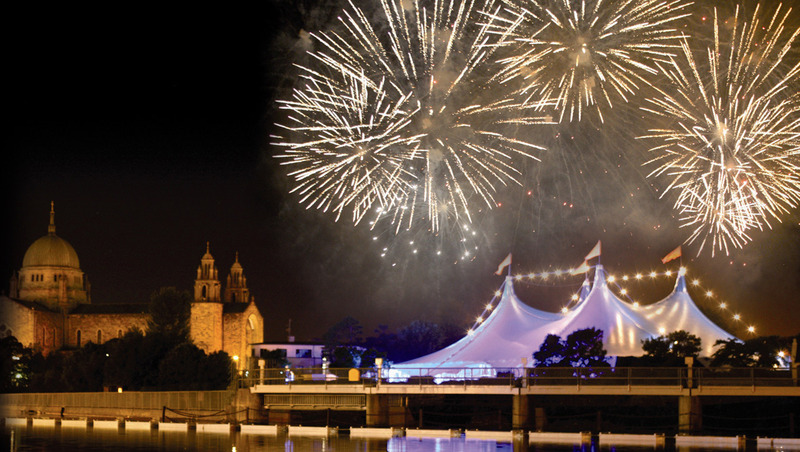 In addition to the three sites above, Dublin is a UNESCO City of Literature and Galway is one of only five UNESCO Cities of Film. And as if that weren't enough, here are another eight Areas of Outstanding Natural Beauty for your walking, hiking, cycling and visual delectation. Enjoy.